Freelancing or working from home are becoming more common these days as freelance websites are getting increasingly popular and there’s money to be earned. Some are even so successful in freelancing that it became their full-time job. Do note however, that not everyone can get a full-time income. It’s not as easy as it sounds to become a full-time freelancer. Read this article on what you should know before becoming a freelancer. One of the main reasons why freelancing is so well-received is that your working schedule is pretty flexible compared to conventional jobs. Furthermore, the concepts of working from home and being your own boss are very tempting, especially if you work till late at night every day. That said, you might face problems of having terrible clients, no clients at all or even tight schedules (which is ironical). 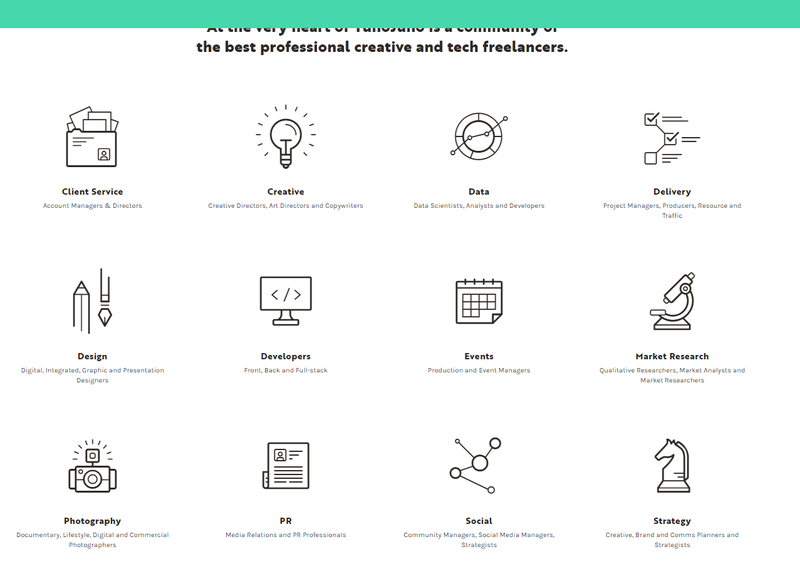 If you’re still interested to know what are the freelance websites available to you, continue to scroll down. Disclaimer: There may be affiliate links which means that I earn a small commission if you sign-up for a service using my link at no additional cost to you. If you are a freelancer, you definitely would have heard of Upwork before. It is perhaps one of the best and largest freelance communities around. oDesk and Elance merged to form Upwork. The great thing about Upwork is that thousands of jobs are posted online every day and in almost every category imaginable. Membership is divided into free and premium although there isn’t too much of an advantage for getting a premium membership. A free membership gives you approximately 30 bids a month, whereas a premium membership gives you slightly more and also the option to buy bids. 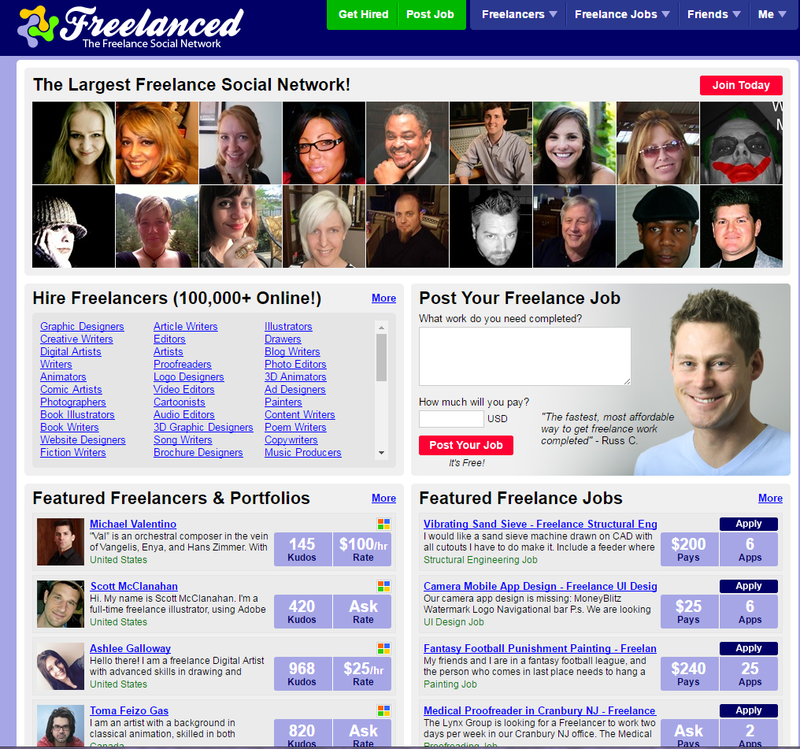 Freelancer.com is supposed to be the largest freelancing marketplace with about 23 million employers and freelancers. Similarly with Upwork, there are lots and lots of jobs posted online. They have all kinds of categories but surprisingly they even have jobs for the “adult section”. Membership is free but you are only allowed to bid for a job 8 times a month. Paid membership will give you hundreds of bids per month, which is a substantial difference compared to Upwork. Therefore, Upwork seems to be a better choice if you opt for a free membership. 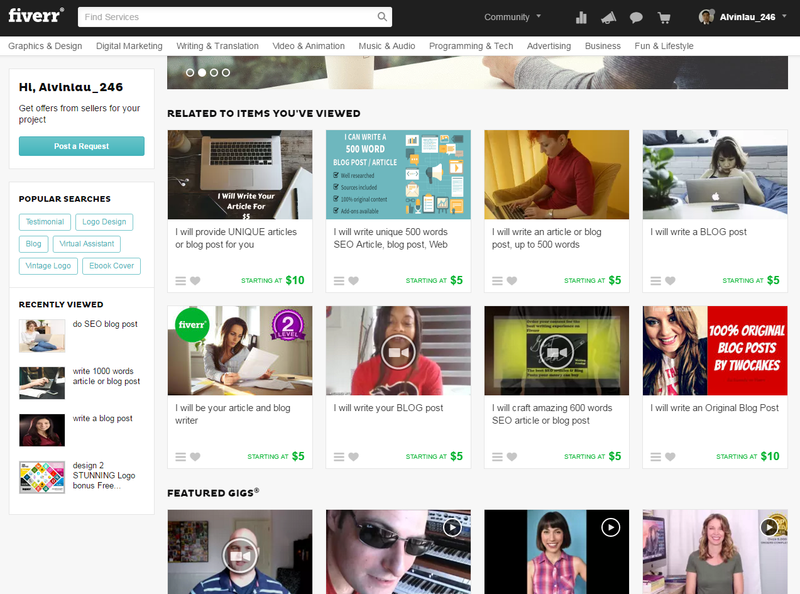 Fiverr is one of the most popular freelance websites that enables you to sell gigs to others at the minimum price of $5. It’s different from Upwork and Freelancer.com as you don’t bid for proposals. Instead, you have to sell gigs and potential clients will browse through a list of gigs in the chosen category. For instance, you can sell your writing services for $5 per 500 words and if someone wants to buy, he will make an order. Like other freelancing platforms, it’s not easy for a beginner to actually get orders. This is probably because potential clients will normally choose those who have a great work record. Hence, you would have to come up with something really attractive and professional to actually get clients. Founded in 2007, PeoplePerHour is a UK company which is very similar to Freelancer.com and Upwork. Similarly with Upwork, it has an escrow system where the client has to first deposit the money. It will be released once you have finished the job. Hence, it’s quite safe to work with. They also allow video calls on the platform, between the client and the freelancer. The main thing that could improve is perhaps the speed of the website. It’s a little on the slow side in terms of loading speed and it can be annoying to users. The user interface might be quite confusing as well, so it takes time to get used to it. 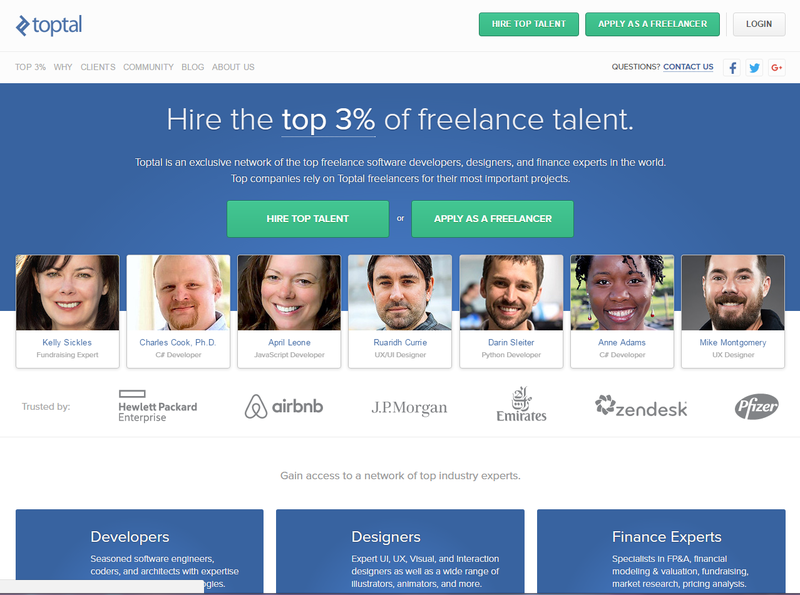 Next on the list is Toptal, a freelancing platform for the elite freelancers. Toptal only offers three categories, i.e. developers, designers and finance experts. Hence, if you’re looking for a data entry job, this is not the place for you. Furthermore, they emphasize on hiring only the top 3% globally. Therefore, this is not the place for new freelancers. Only those who have lots of experience and have developed quite an expertise in any of those fields should try it out. As they impose such stringent requirements, it is no surprise that their clients are huge companies like Airbnb, J.P.Morgan and Pfizer. Guru is another huge freelance site similar to the abovementioned platforms. Like the rest, you can bid for a job that has been posted. Their biggest categories are “Web, Software and IT”, “Design, Art & Multimedia”, “Writing and Translation” and “Admin Support”. As there are many freelancers on Guru as well, competition is fierce. Like other freelance websites that utilizes the bidding system, you end up bidding really low to get a job. This results in you working for a lower pay. It’s still good if you’re from a country with a weak currency as you can earn in USD. 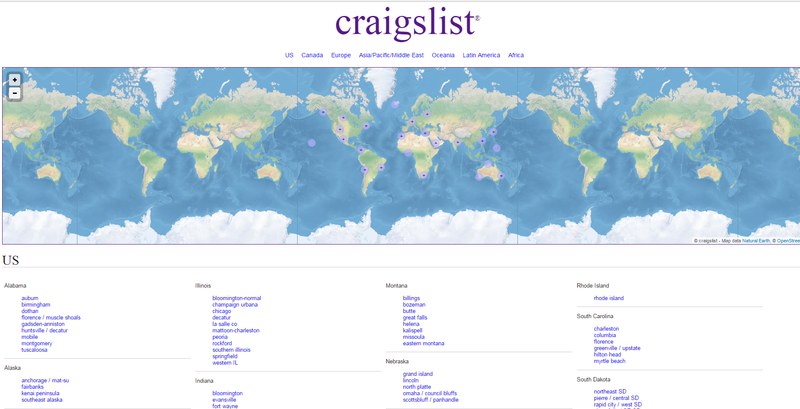 I am sure most of you have heard of Craigslist before. They are an American website normally known for items for sale, advertisements, housing and so on. Back then, I didn’t know that they offered freelance jobs as well. They have all kinds of job advertisements, including writing, marketing, web design, software and tech support. If you’ve not tried it, you should at least check it out. As the name suggests, 99designs is a freelance website for creative designing. It has so many categories pertaining to design which includes designing logos, web design, app design, business & advertising, books, magazines, clothing, merchandise, art, illustration and even labels. They are constantly looking for creative designers. It’s quite a good tool for potential clients as well, as they can launch a contest via 99designs. Designers from all around the world can compete to design the best logo for a company and the one that gets chosen gets paid quite a lot. FlexJobs is different as it’s not a free platform. To become a member you have to pay for a monthly subscription plan. Why should you pay to get work? That’s the question I had at first. The whole purpose of paying is that FlexJobs only advertise jobs that are legitimate. It means that they actually do a screening process for potential employers to ensure that freelancers or full-time workers will not get scammed. Whether it’s worth it or not, that’s up to you. Number 10 is an interesting one. 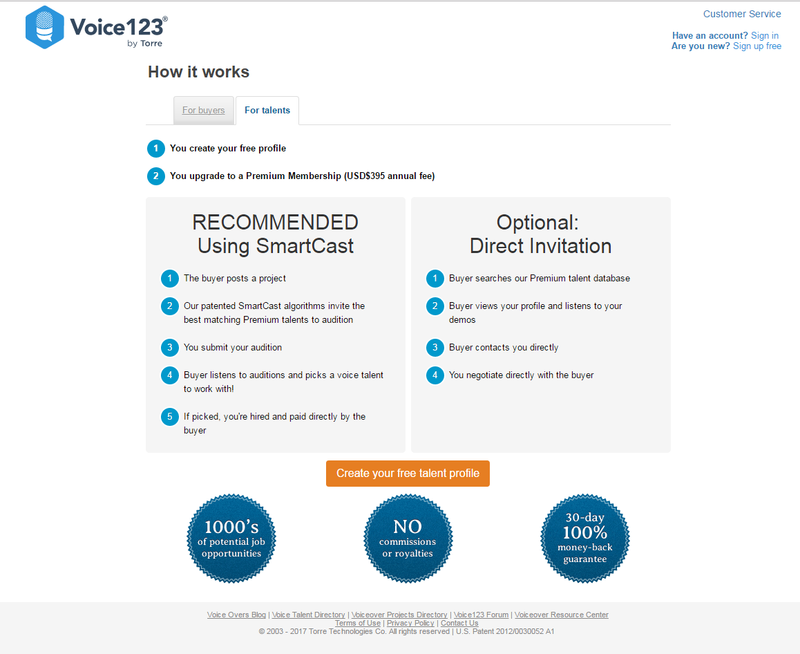 If you are a voice talent interested in getting a job as a voice actor, you can try Voice123. They use SmartCast, an algorithm to connect potential clients to the best voice over talents. Do note however that membership is pretty steep. At the time of writing, it’s about $395 annually. Hence, this is more for those who are really serious in voice acting. 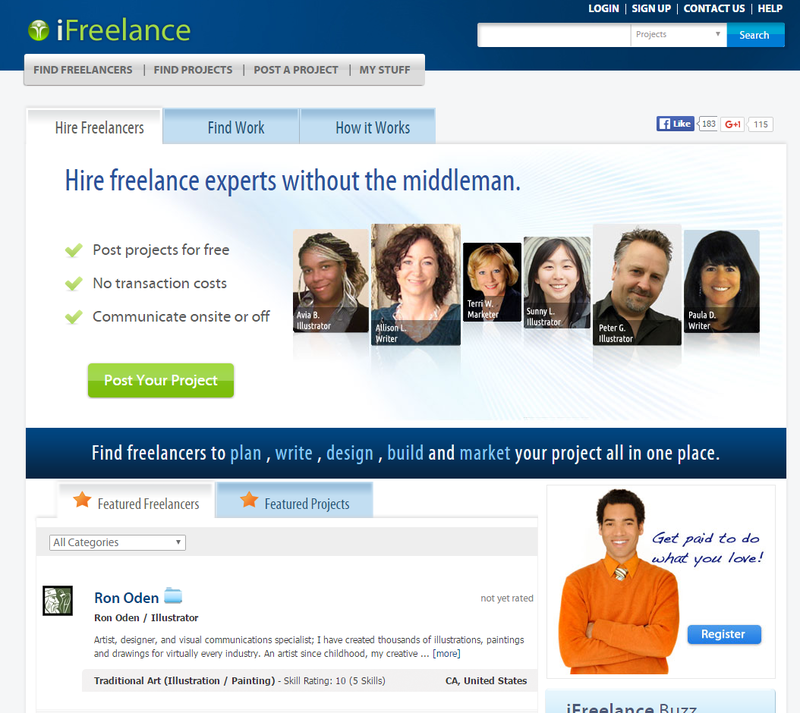 iFreelance is also one of the bigger freelance websites for freelancers. They have many categories as well, including accounting, administrative work, marketing, sales, photography, writing, translation and so on. They are different from Upwork as you need to actually pay for membership before you can even bid. As you’re already paying for membership, you are allowed to keep 100% of your earnings. On the other hand, sites like Upwork charges a very high commission of 20% on your earnings although membership is free. On first impression, Damongo is quite similar to Fiverr. They have many categories as well, including writing, translation, graphic & design, music, business, programming, tech and so on. It is considered as a micro job market, and freelancers sell gigs which ranges from $5, $10, $20 and $50. 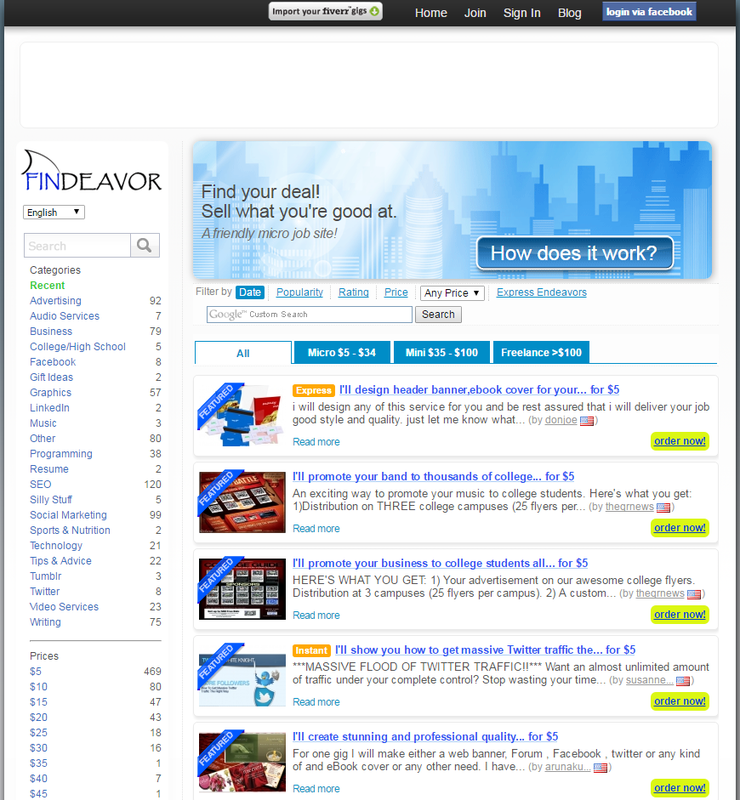 Findeavor is also similar to Damongo and Fiverr. They post micro jobs, mini jobs and freelance jobs. They cover many categories which includes, amongst others, tech, writing, video, programming, music and graphics. The prices here range from $5 for a micro job to $300 for freelance jobs. They categorized micro jobs as $5 – $34, mini jobs as $35 – $100 and freelance jobs as above $100. Amazon Mechanical Turk or commonly known as Mturk, is a micro jobs site. A lot of freelancers, especially from the US, love to do micro jobs for Mturk. The main reason for its popularity is that they have hundreds of thousands of jobs, which you can do in batches. Good jobs in Mturk would allow you to earn a few cents per a few seconds, which may add up to a decent hourly wage. However, it’s extremely difficult to get accepted into Mturk, especially since they have so many applications. If you’re not from the US, it’s even more difficult to get in. 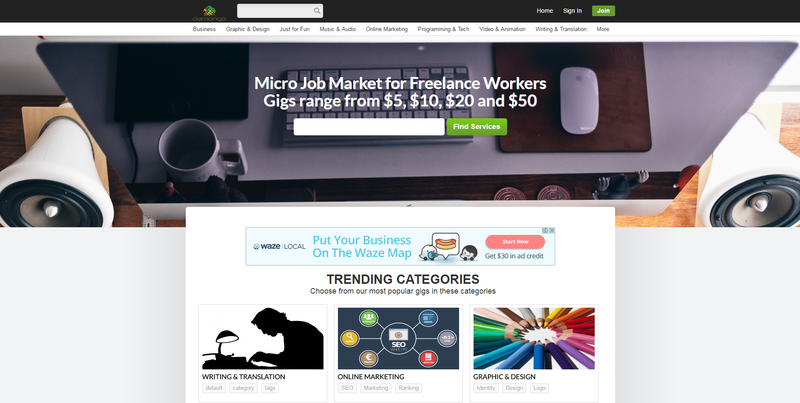 Microworkers is another micro jobs website, which allows you to earn pennies for easy and quick jobs. They usually require you to either share links on social media, write comments or even sign up for websites. Most of their jobs are pretty simple in nature. Hence, it doesn’t pay much. CrowdSource is also known as OneSpace and they are quite exclusive, as you need to be trained and tested before you can join. Only qualified workers can choose tasks from their catalog of work. They offer four main categories, i.e. copywriting solutions, content moderation solutions, data solutions and transcription solutions. Spare5 is another micro jobs site but it can help you to earn a little extra income each month. Basically you do very simple tasks and they pay you pennies per task. For example, you might be asked to create keywords for an image, draw boundaries, label images or even do super short voice recordings. Their clients are in the AI industry, so these tasks actually help in developing AI. I wouldn’t recommend it if you’re looking to make serious money. 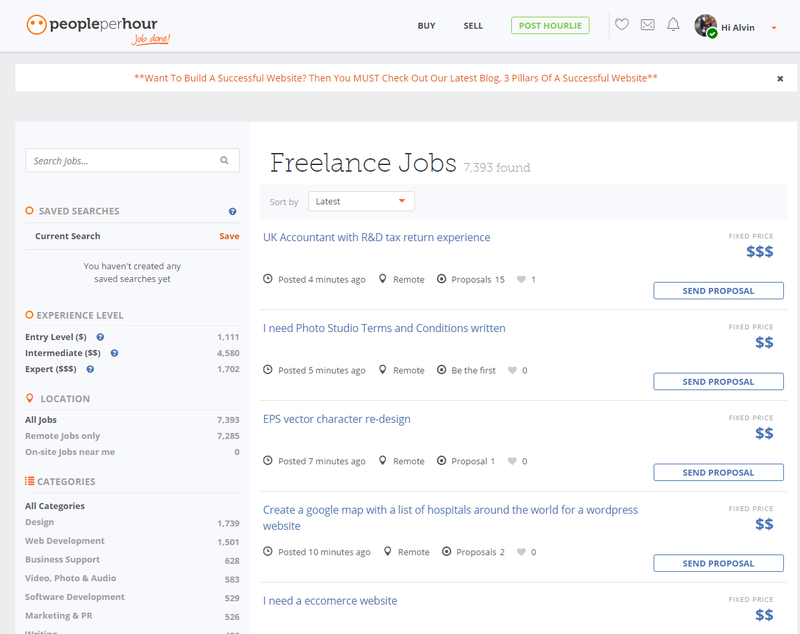 Behance is a freelance website for creative freelancers. If you have lots of creativity, this might be the right site for you. Their main category is creative fields and it’s divided into many divisions, including architecture, photography, UI/UX, web design, illustration, fashion and graphic design. This is basically the Fiverr equivalent for the creativity industry. You have to create profiles that are extremely creative and potential clients will browse through freelancers’ profiles in respective divisions. I’m sure most bloggers would have heard of ProBlogger’s Darren Rowse at some point of your blogging “career”. 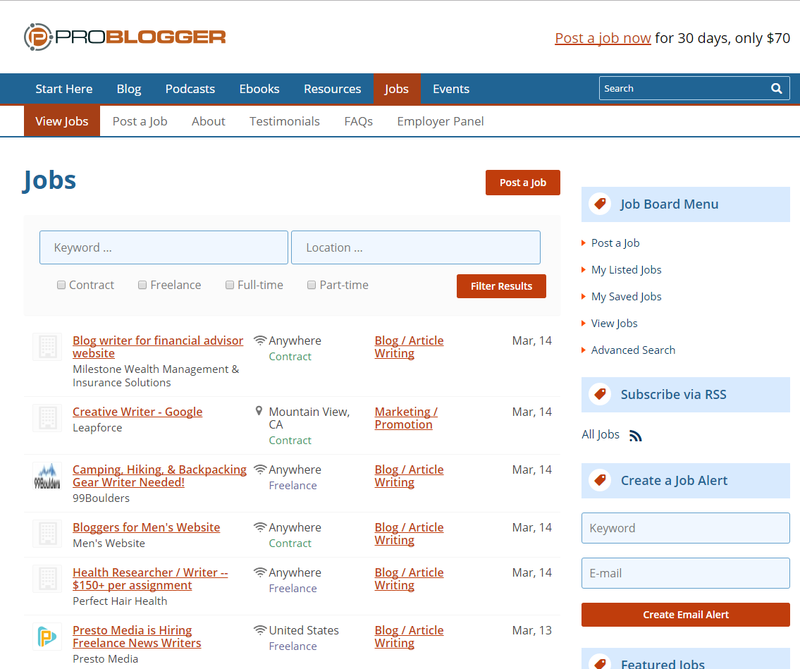 If you’re not aware already, his popular blogging website ProBlogger has a jobs section as well. Most of the advertisements are for writing jobs and they’re mainly looking for experts in writing. If you’re a blogger yourself, you can earn a decent income by taking up some of these jobs. Some of these jobs even pay $200 per article. 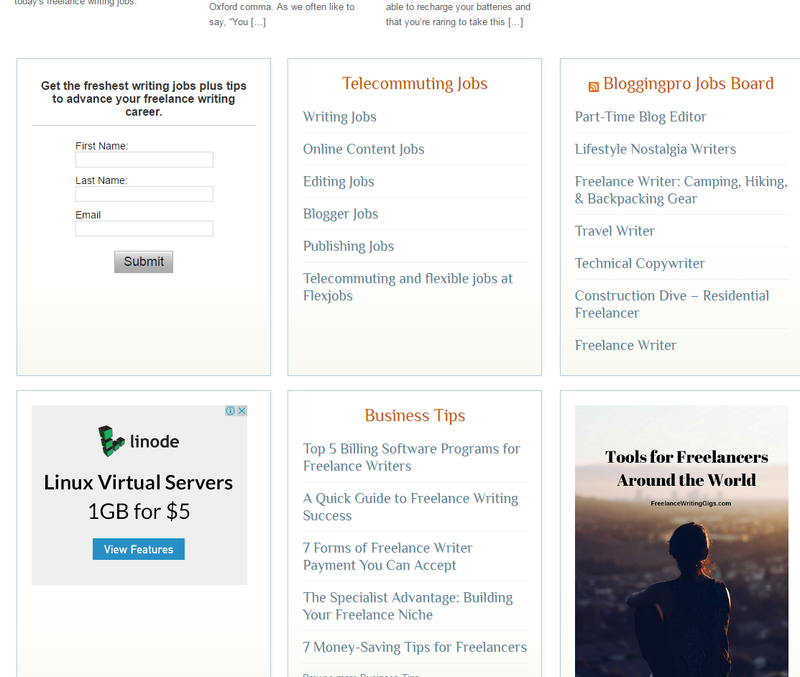 This is a website which posts writing jobs that are available online. It’s quite similar to number 19 above, as they are mostly writing or editorial jobs. If you’re into writing, you can take a look at this website as well. They post jobs from other sites as well. 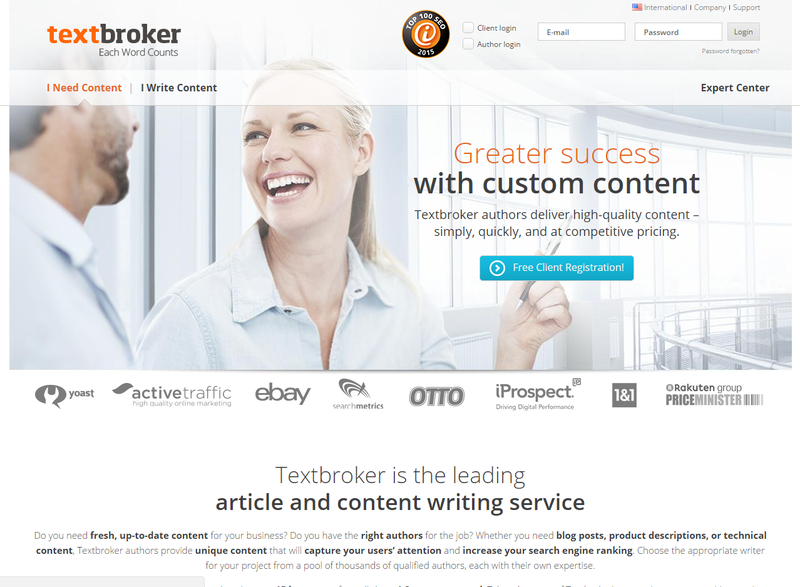 Textbroker is an online platform where you can either sign up as a writer or as a potential client looking for writing to be done. They have a fixed payment system, unlike some other websites. If you have heard of iWriter before, you should know of Textbroker as well. I’m not personally fond of iWriter though. In Textbroker, your articles are rated by their editors between 2 to 5 stars. There are fixed payments for the number of stars your articles get. For instance, you get 1 cent per word if your article is of 3 stars quality and 5 cents per word for 5 stars. You may get direct orders as well where the minimum rate is about 1.7 cents per word. However, they are open to only US freelancers. 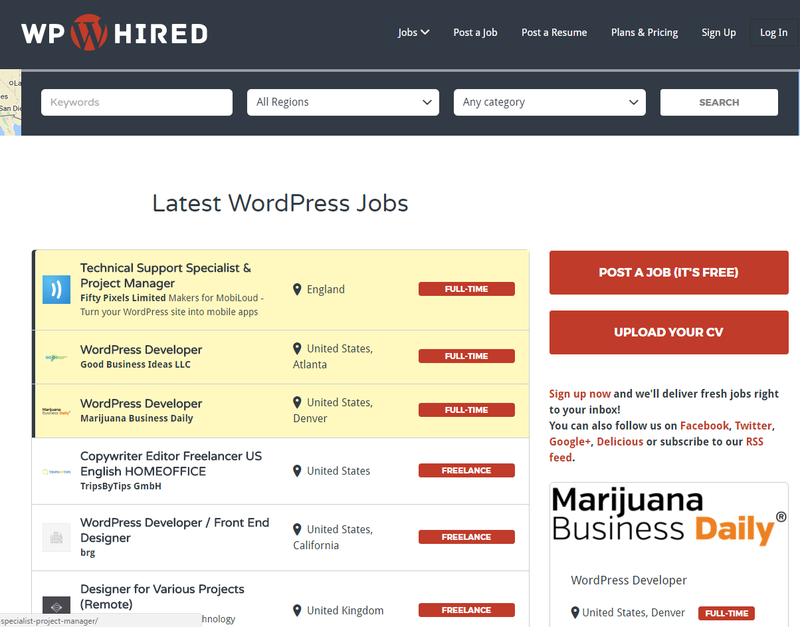 As the name suggests, this is a platform for WordPress jobs. However, they are not limited to just WordPress developers or designers. They have other categories as well, including site migration, writing, SEO, theme customization and so on. If you’re quite a technical expert with WordPress or if you’re good with SEO, you can try to find jobs here. ProZ is one of the bigger freelance websites for translators. It is like a huge directory for freelance translators around the world. They are one of the most well known translation platforms for freelancers. They have two types of memberships, free and paid. If you’re using a free membership, you can only bid for jobs 12 hours after it has been posted. Those with paid membership can bid immediately which is a huge disadvantage for free users. 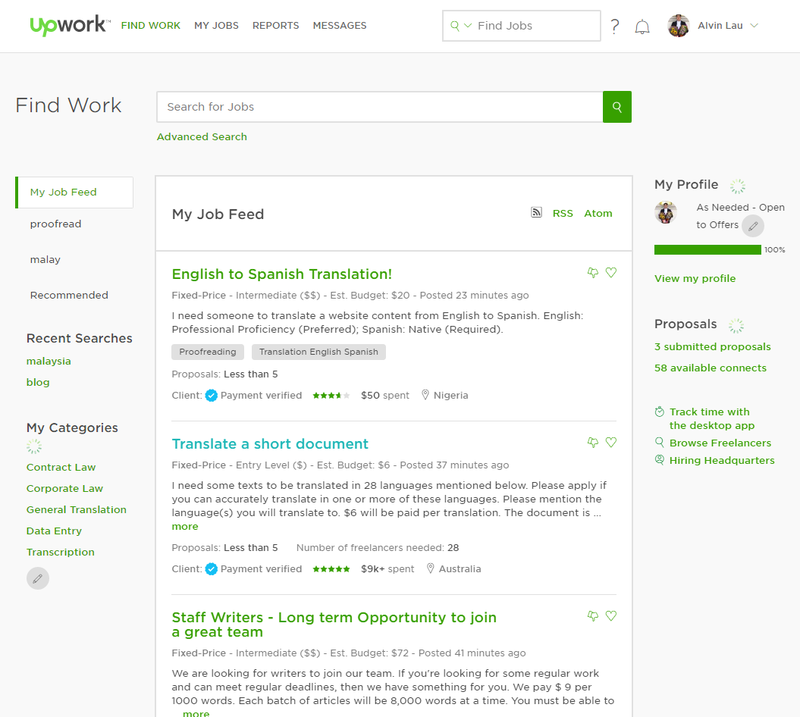 Personally, it’s easier to get hired for translation jobs in Upwork. Taskr is India’s first micro-service marketplace. It is very similar with Fiverr, Findeavor and other platforms where you have to promote your service. Basically, you have to create your profile, post tasks that you are willing to offer and wait for potential clients to make an offer. There are all kinds of tasks including web design, SEO, logo design, selling “likes” on social media and so on. 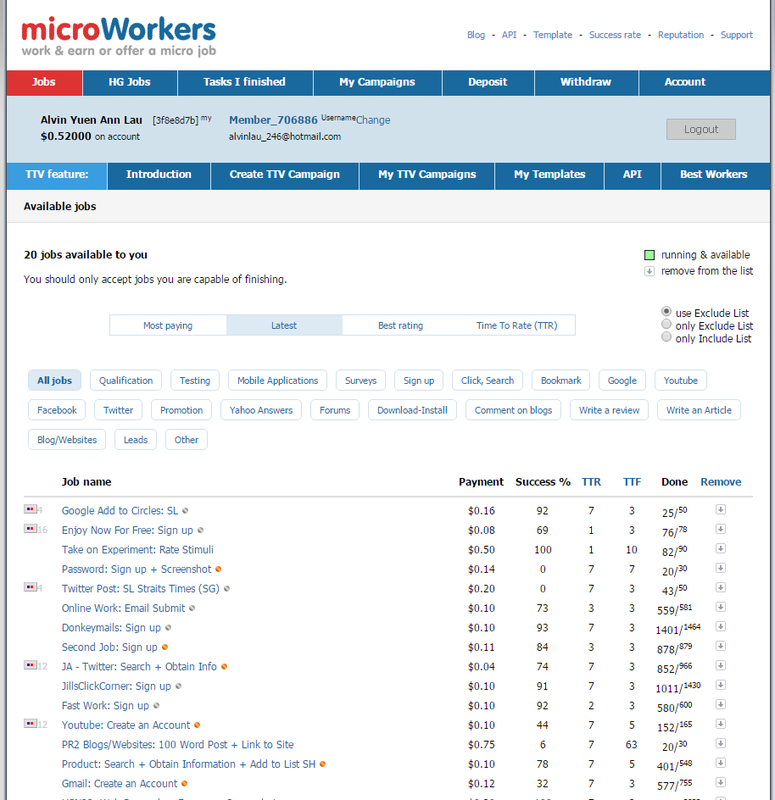 RapidWorkers is more of a micro jobs website, which looks very similar with Microworkers. Basically, you do micro tasks for pennies. There are all kinds of tasks, including following someone on Twitter, voting for a YouTube video, creating a Gmail account for someone else and so on. For instance, following someone on Twitter can earn you about $0.12. GigBucks is another freelance site where you sell your services. Basically, you can list any type of service that you can offer. They have all kinds of categories including business, advertising, photography, writing, social marketing and translation services. Prices range from $5 to $50 for each gig. Some even sell followers on social media. Personally, I’m against such services as they bring no engagement value. Some celebrities even buy such services just to raise their numbers. Freelanced is a huge platform for freelancers. Perhaps this should have been listed much higher. They claim to have over 100,000 freelancers online. They cover all types of categories including writing, translations, designers, accounting, illustrations and so on. 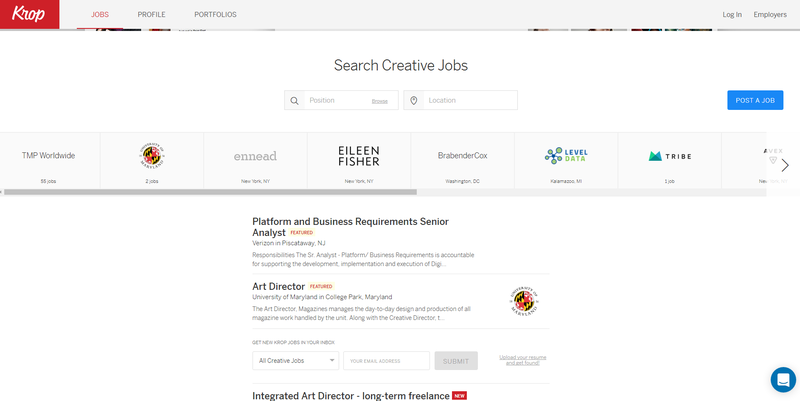 Like Upwork, Freelancer.com or PeoplePerHour, they allow you to create a portfolio for you to market yourselves. You can also choose to browse the available jobs and apply to be chosen. You should check out this site as well. What comes before Fiverr? Fourerr. Okay, that wasn’t funny. 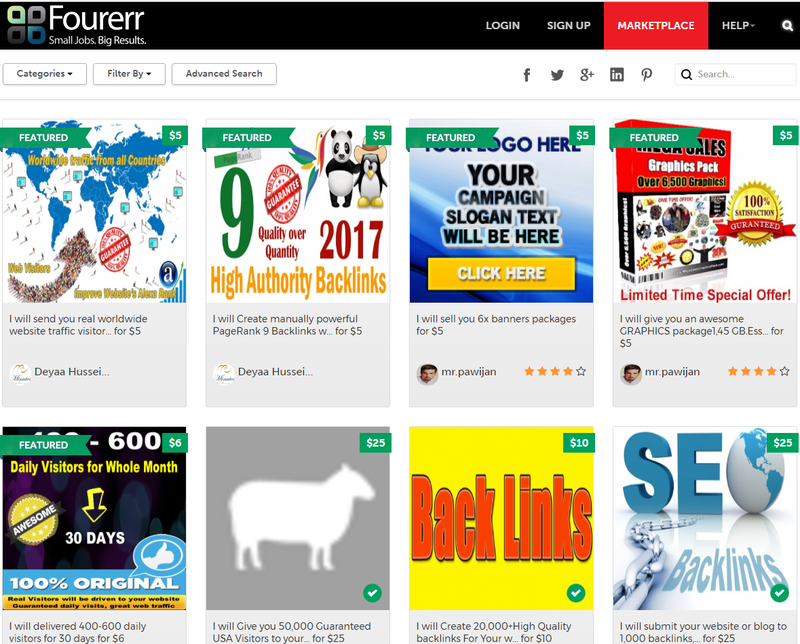 Fourerr is another micro jobs site which is of course, very similar to Fiverr and the other sites mentioned above. They have various categories, i.e. graphics, design, multimedia, writing, translation and so on. Prices go from $4 (suits the name I guess) up to $25. 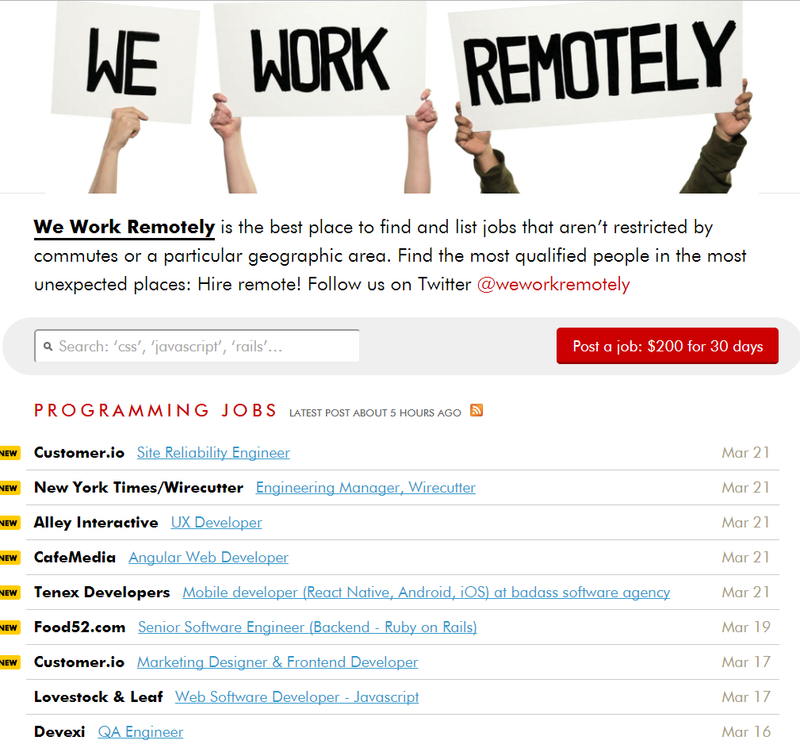 We Work Remotely is a place to find jobs that can be done remotely. They have a lot of categories as well, i.e. 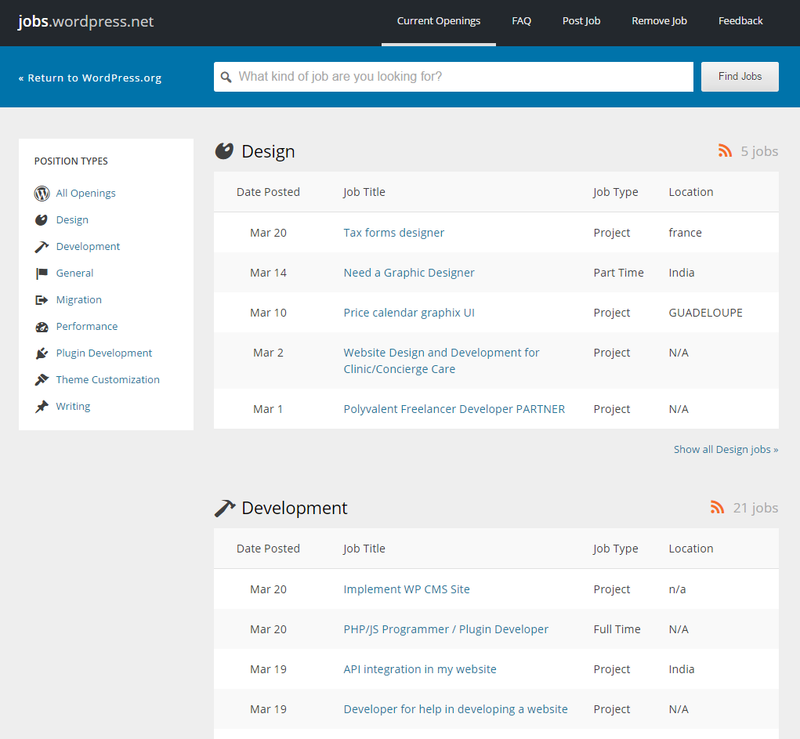 programming jobs, marketing jobs, customer support jobs, copywriting jobs and design jobs. If you’re interested in working remotely (I should stop with the puns), this is the place for you. Authentic Jobs is one of the best freelance websites specifically catered to designers, hackers and creative pros. Do note that some of the jobs are office-based. They have full-time or part-time remote jobs as well for freelancers. If you’re a web production designer, mobile developer or a front end developer, you should be able to find jobs here. OnSite is a platform where you can find both freelance or permanent jobs. If you’re a professional in design, development, illustration, motion, management and so on, you should try out this site. For now, they don’t charge for membership, but you will need to have a good portfolio to get work here. 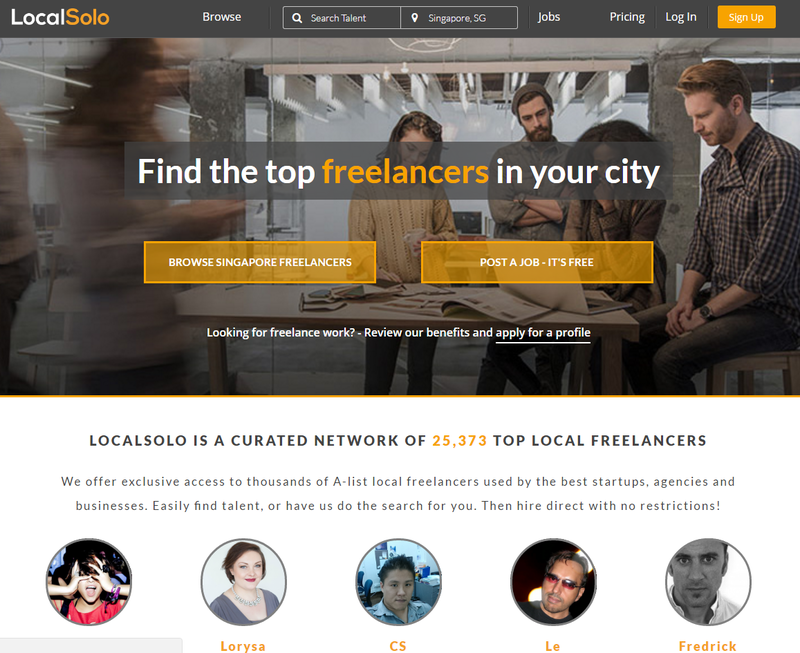 Localsolo is a freelance site where you can find jobs based on your location. For instance, if potential clients need a freelancer in Singapore, they have a database exclusive for Singaporean freelancers only. Same goes to freelancers in other countries. Membership seems to be free for now and they have access to many big clients such as Adobe, DreamHost and Shopify. Their categories include copywriters, designers, developers, photographers and many others. Aquent seems to be exclusive to freelancers in US, and a few other cities in Canada, Japan, Australia, France, UK and Netherlands. They have limited job categories as well, i.e. content & writing, creative & design, development, marketing and user experience. College Recruiter is a freelance website for college and university students and also recent graduates. They are mainly entry-level jobs. You can find jobs in your respective countries though most jobs seem to be location-based. 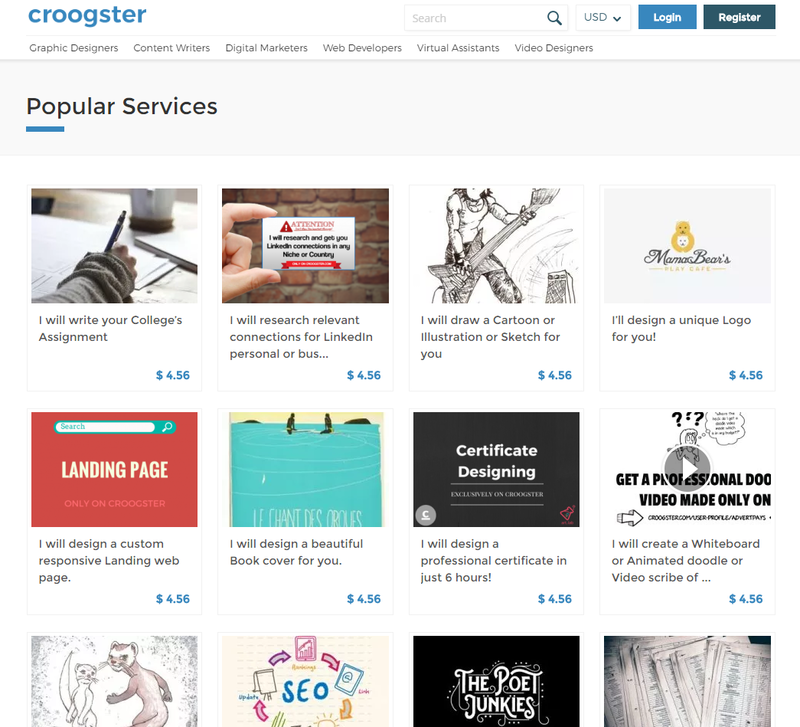 Croogster has a similar concept with Fiverr and Fourerr. Your job as a freelancer is to post your service for a certain price and wait for offers. For e.g. write a 300 words article for $5. However, it has another section where potential clients can post their jobs if they can’t find available services. As a freelancer, you can send your proposal to potential clients if you found a job that you would like to do. Crowded is an online platform that specializes in tech talent. They have a few main categories, i.e. developer, designer, product manager, business developer, sales person and marketer. However, you can also register for another role that is not listed. 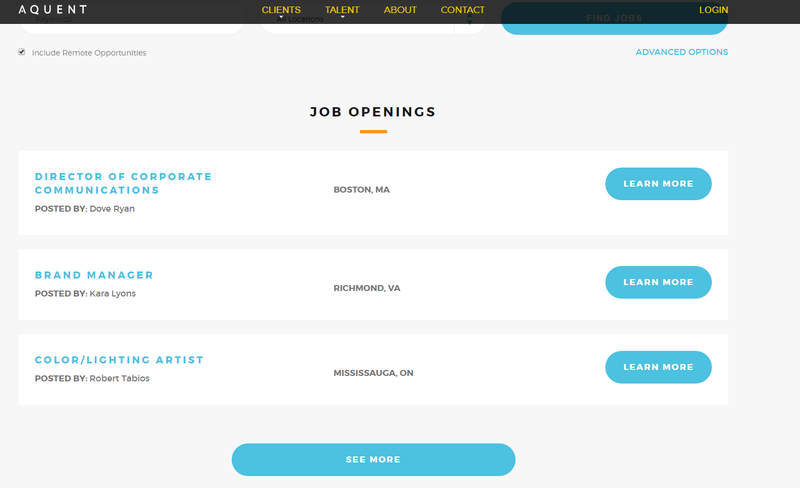 Krop is a creative industry job board and a portfolio hosting website. They look for top talents as they work with huge companies like Apple, Facebook, BarackObama.com, The New York Times, HBO and so many other big names. A lot of the jobs posted are for web designers, digital designers and so on. Considering the big clients, it may not be easy to land a job unless you’re really talented in those fields. I’m sure most of you have heard of Mashable. It started off as a blog but it’s now one of the biggest news website generating millions a month from advertising. 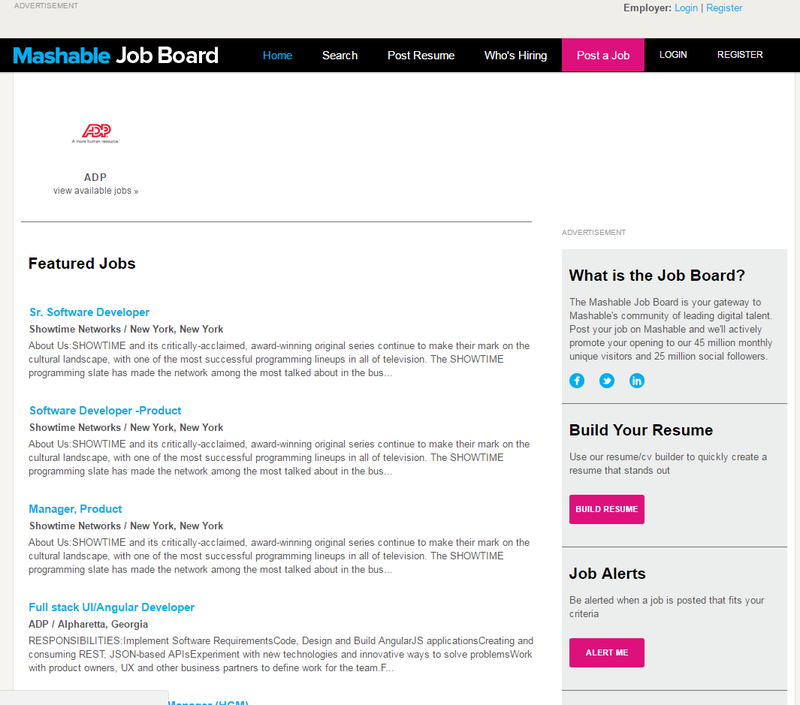 They came up with a job board as well which is mainly related to tech. Many of the jobs may be location-based though. Peer Hustle is different from the rest as it functions purely using a mobile app, rather than through your desktop or laptop. It works by showing potential clients all of the freelancers that are in the local area. For instance, you can hire photographers, models or even videographers who are located near you. 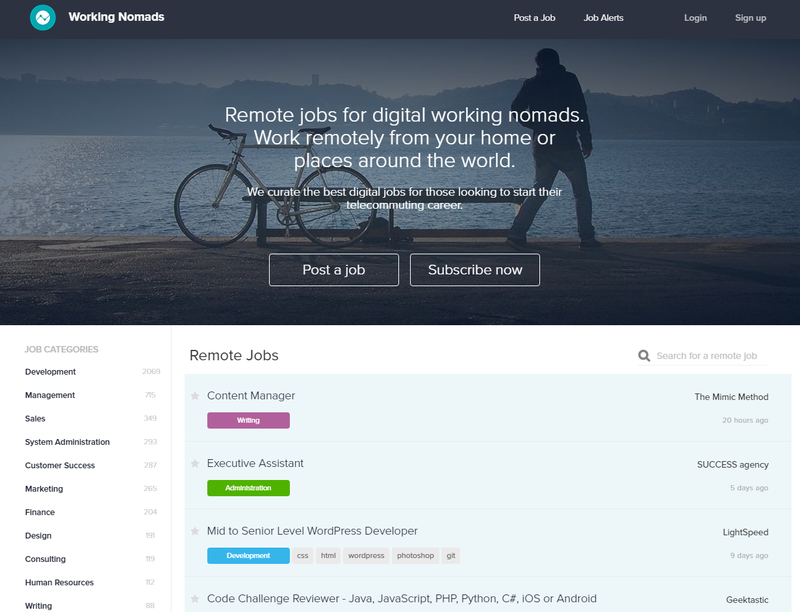 Working Nomads is a platform to find remote jobs for digital working nomads. You can work remotely from anywhere in the world. They have all kinds of categories as well, including development, management, sales, marketing, design, writing and so on. If you’re interested, you should check it out. 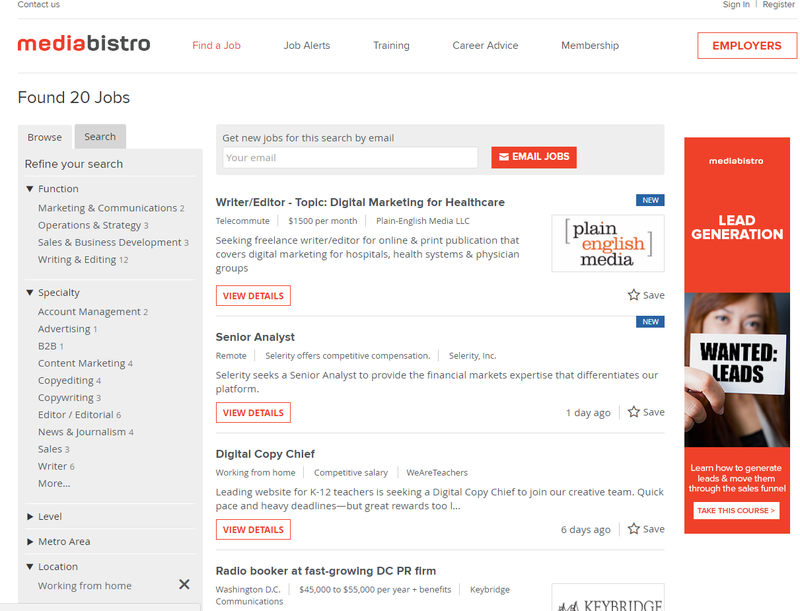 Mediabistro is a big media job listings site for savvy media professionals. Like other freelance websites, they have all types of categories including journalism, operations, digital marketing, account management, writing, social media and so on. Nevertheless, most of the jobs are location based (US). There are work from home jobs as well but not as many. 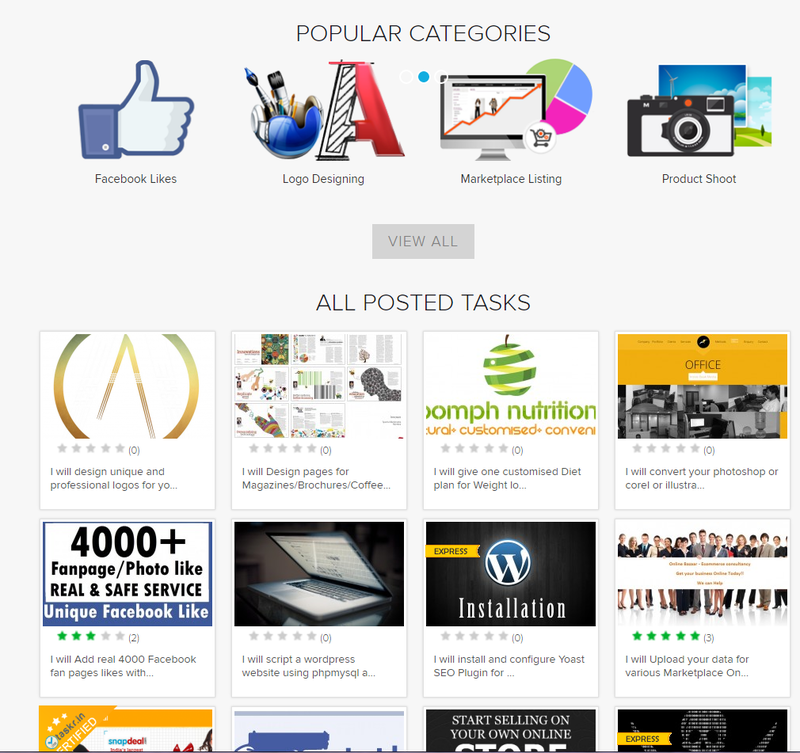 Clickworker is more of a micro jobs website, where you do simple tasks and earn a few cents for each task. It does not earn you a full-time income but it’s better than nothing. Some of their jobs are really simple, e.g. copy and paste jobs or surveys. 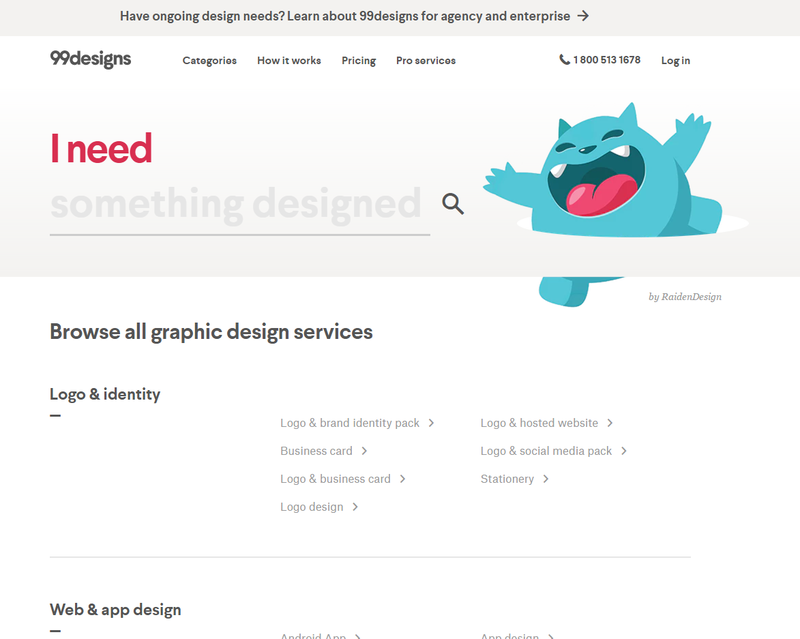 Designhill is one of the best freelance websites for designers. What kind of designs? They have probably more than 30 different types of design jobs including logo designs, blog designs, tattoo designs, t-shirt designs and banner designs. If you specialize in designs and you’re quite creative, this is the place for you. 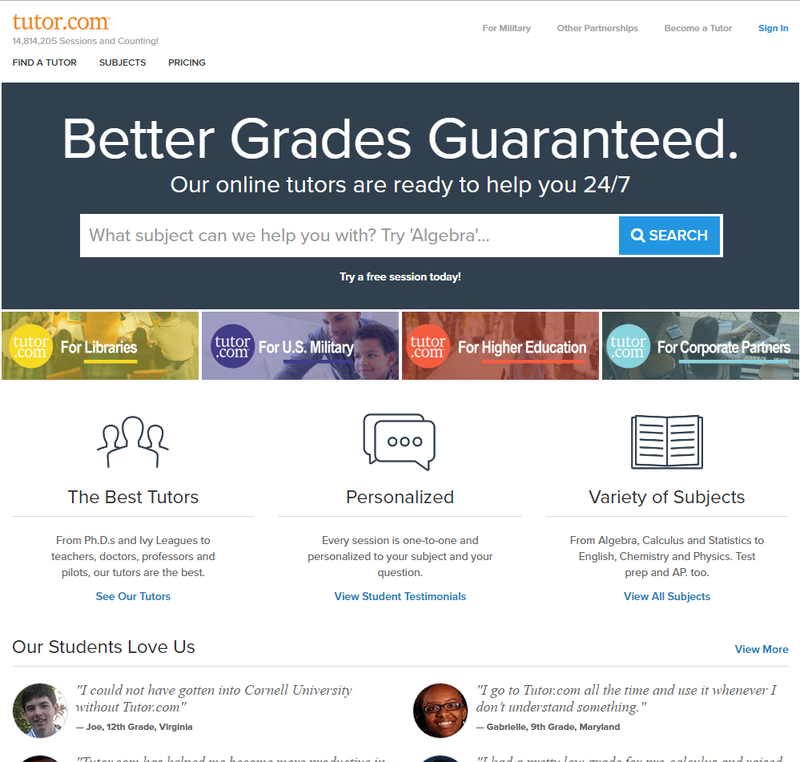 I am confident that you would have heard of Tutor.com before at some point of your Internet life. If you are an expert in a particular field, whether it’s mathematics, science, English, other languages or even business, you can apply to be a tutor. It doesn’t have to be a full-time job, as you can apply for a part-time position. 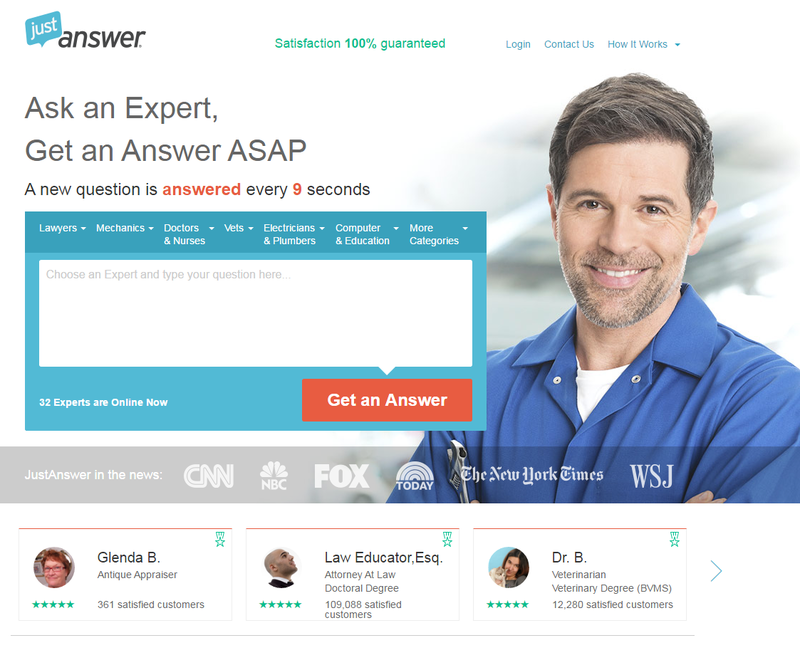 JustAnswer is another popular website where you can ask almost any question and get an answer from an expert in the respective field. They have lawyers, doctors, electricians, computer experts and many other experts on their site. Basically, customers pay for memberships, i.e. basic, plus or premium memberships before they can ask questions. As a freelancer, you can join them as one of their experts and you get paid for answering questions. 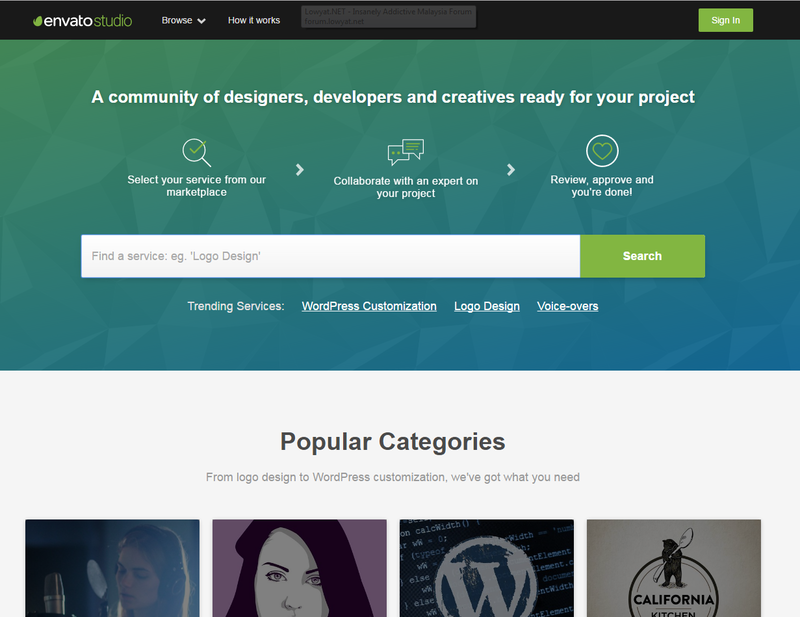 Envato Studio is another freelance website mainly for creatives, designers and developers. Their popular categories are audio, design & graphics, WordPress, logo design, online marketing, video & animation, mobile & apps and websites & programming. If you fall under any of those categories, you should give this website a shot. It works like Fiverr as well where you have to sell gigs and potential clients have to order from you. Nonetheless, you can charge much higher prices here unlike the other platforms. Good news for WordPress experts. 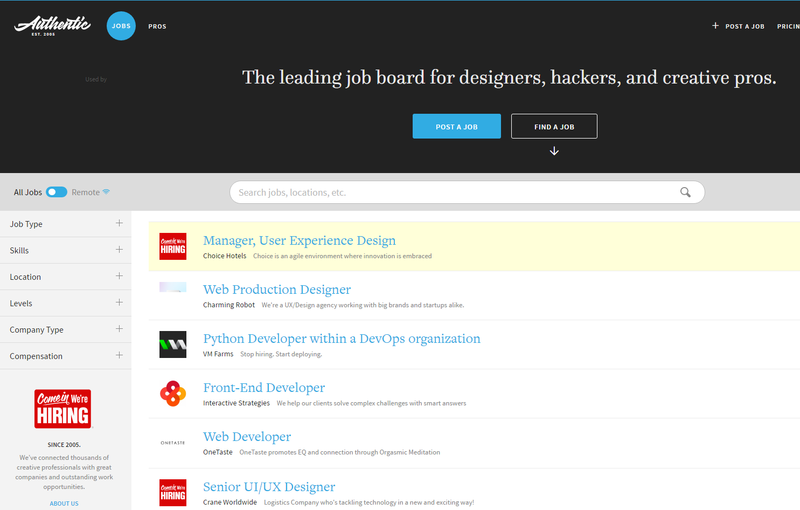 WordPress itself has a job board as well, for those who are experts in this field. They have all types of specific categories, for instance, migration, development, design, plugin development, theme customization, performance and even writing. Even if you’re not an expert in development, plugins, themes or other technical matters, you can apply for writing jobs as well especially if you’re an expert in SEO. Crew is one of the freelance websites that specializes in creating apps, websites, logos or brands. If that is where your expertise lies, you should check out this website. However, it’s not a platform where you can easily sign up and start bidding. You need to apply and there’s a waiting list before you can get selected. You can try Folyo as well if you’re looking for online jobs. Unlike other platforms, Folyo doesn’t charge commission from your work, so you can keep 100% of your earnings. They also monitor all of the freelancers to prevent fake users. It seems to be quite a small platform as they only have three people in their team. Let me know if you have worked for Folyo before. Unlike some other freelance websites, YunoJuno doesn’t charge freelancers for a membership plan. Instead, they charge only the employers about 9% of the agreed rates between the employer and the freelancer. Freelancers are paid after 14 days from the job completion. They also have all kinds of categories including developers, design, market research, photography, film, UX and so on. 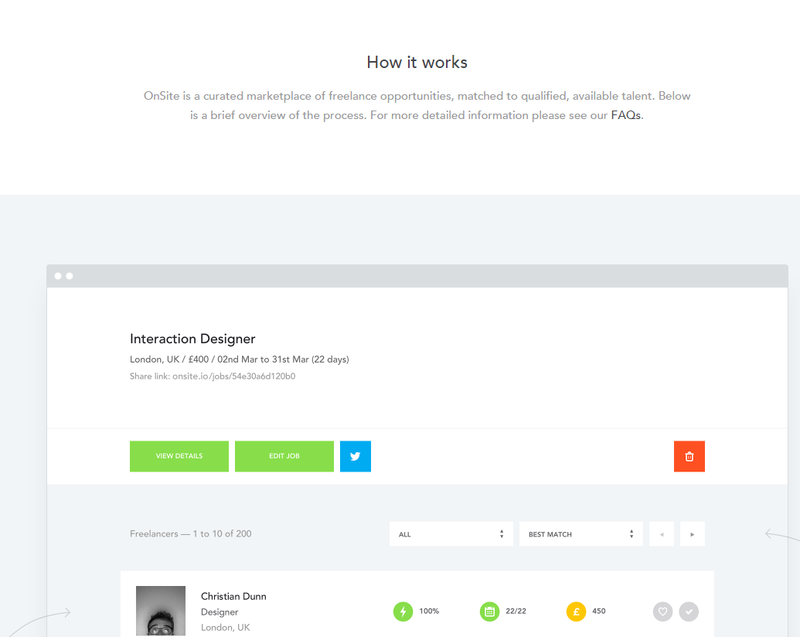 If you are a full-time freelancer, you should check out gun.io. They specialize mainly in the software development industry. They have had big clients like Amazon, Lonely Planet and Wikipedia. If you’re good in software development, you can apply as a freelancer with them. 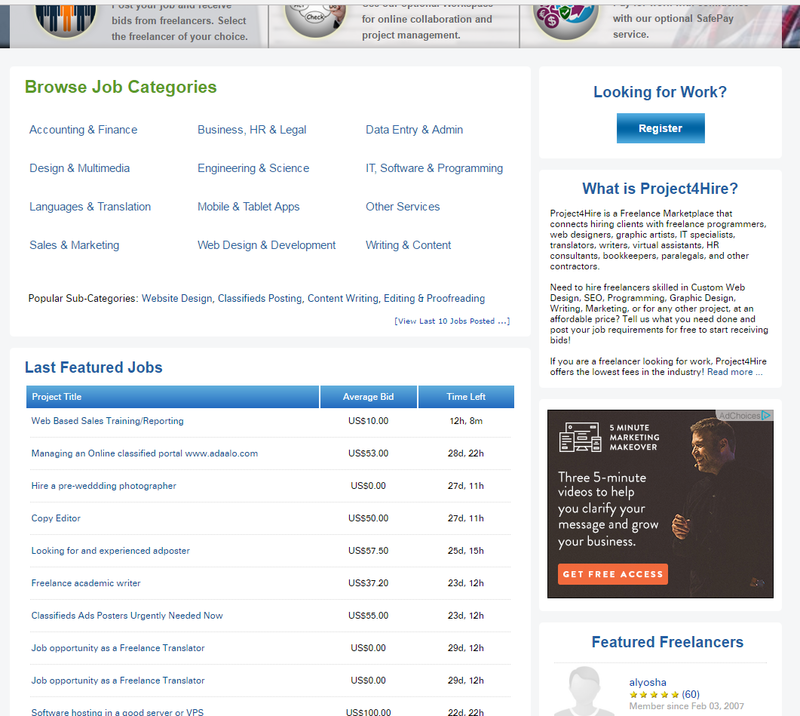 Project4Hire is also one of the bigger freelance websites like Freelanced. Similarly, they have many job categories, i.e. business, legal, translation, sales, marketing, IT, data entry, writing, web design and many more. 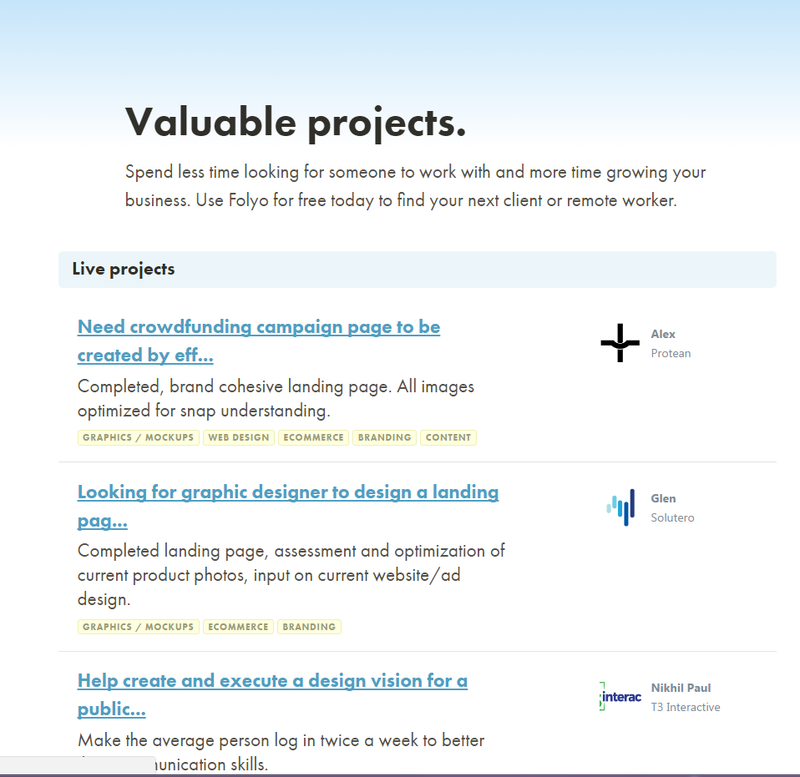 If you’re not getting much work on Upwork or other popular platforms, you can try Project4Hire. You don’t have to limit yourself to just one platform. Try multiple platforms to see which site actually works the best for you. They have a free and paid membership as well. Which of them are the best freelance websites for you? There are so many freelance websites in 2017 as more and more sites are sprouting rapidly. It is vital for freelancers to use legitimate platforms to prevent being scammed. Personally, I prefer Upwork over the rest, specifically for translation jobs as I have had the most luck there. 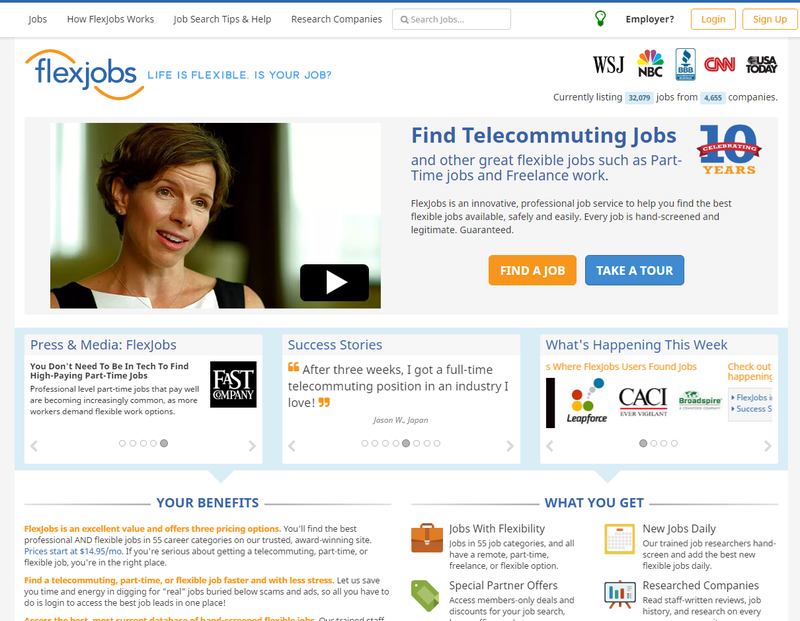 If you love writing jobs, you can check out this article on 11 websites that pay you to write. Do let me know in the comments if you have more freelance websites to share. Please share your personal experiences with one or more sites listed here as well. Thanks for dropping by! I also suggest sites like remote.com and golance.com. the last one I mentioned has unlimited biddings! My experience with sociobid was simply best. Very professional freelance platform to get your job done. The best thing about sociobid is that it’s absolutely free for Employers. There are no hidden charges no hassle. Simply love it. Thanks for posting this it’s very helpful. There’s a lot to absorb on this blog but your list is cool. Cheers! If you are a Filipino looking for a home based job, you might want to check us out. Virtual Coworker is a Recruitment company based in Australia who taps BPO Professionals from the Philippines to work from home for companies in Australia, USA, Canada and UK. Starting our operations in 2011, our contractors are growing steadily and securely. Which of these do you suggest someone start with? Specifically if someone already works full-time outside of home? I have signed up for UpWork and TextBroker, but people offer really, really low pay for a lot of work! I personally prefer Upwork since I get more offers there. And yes the rate is really low. 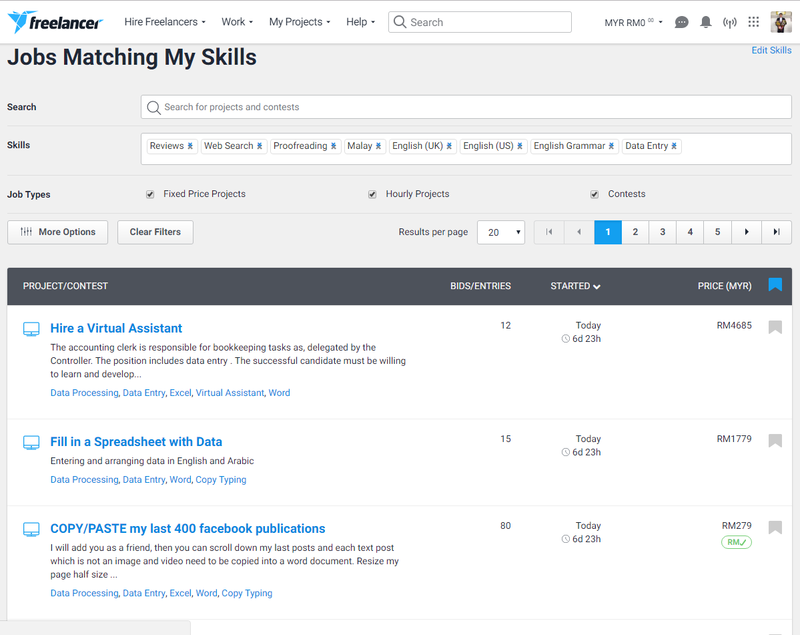 If you would like higher rate for writing jobs, try Problogger’s job board. They pay much higher but it’s harder to get an offer. thanks for sharing this list, being sahm this is good list to try. shall check out one by one when have the time. Wew. So much to put in my brain. Never heard of most of the web. Its a good info btw. Thanks for the comprehensive list. I wish that I can work from home also. Thanks for sharing. Really useful for me to find freelance job here!